Hollywood promo of 2002 featuring Matt Damon. Jason Bourne is the name of a fictional intelligence agent who suffers from amnesia and has CIA assassins chasing him. He’s been on the run since 1980 when novelist Robert Ludlum first created him for his popular spy thrillers, and he is still on the run today in a series of popular films, played by actor Matt Damon. The Bourne storyline, in fact, has proven to be a gigantic economic success, as Jason and his creators have provided for a continuing line of Bourne hits, including: three initial best-selling novels; a two-part television series in the late 1980s; five Hollywood movies since 2002; a new author to keep things going after Ludlum passed on in 2001; ten more novels between 2004 and 2016; a video game in 2008; and very likely, much more ahead. To date, Jason Bourne & Co. have created a global entertainment empire generating more than $1 billion in economic activity. Consider first, the Ludlum books. 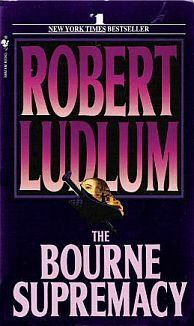 Robert Ludlum was already a successful novelist when he wrote the first Jason Bourne novel in 1980, The Bourne Identity. The spy thriller genre was well established by then. Ian Fleming had produced his 14 James Bond novels during the 1950s and 1960s, and John le Carre had among his best-sellers, The Spy Who Came in From the Cold of 1963 and Tinker, Tailor, Soldier, Spy of 1974. But Ludlum was a prolific writer who had scored best sellers in the early 1970s. By 1980 he had written eleven novels and had a considerable following. 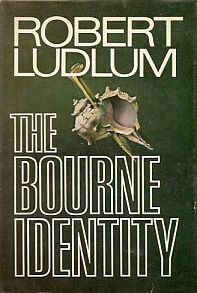 In fact, by the time his first Bourne book appeared, Ludlum was the brand name, not Jason Bourne. His name often had the prominent billing on the early covers, helping sell books. Still, with his first Bourne book Ludlum created a memorable character and a plot that begged for sequels. The Bourne Identity is a complicated and intriguing loss-of- identity spy thriller, which places its principal amnesiac character in a dangerous quest in which he also becomes a target. The story opens with a man being pulled out of the Mediterranean Sea presumed dead, with bullet wounds in his back. Still alive, he later awakens on the boat to discover he has no knowledge of who he is or where he came from. There is, however, a piece of microfilm that had been surgically implanted beneath the skin of his hip. In his dreams he finds other fragments of who he might be, and he later discovers he has automatic and deadly martial arts skills as well as weapons knowledge. The microfilm leads to a bank account in Zurich with $4 million, a pile of passports, and a name, Jason Bourne. But in his travels Bourne is soon hunted by both an assassin and the CIA and he begins a life on the run trying to figure out why he is being hunted and who he really is.The Bourne Identity spent 95 weeks on the bestseller list. And with that, the Bourne saga begins. “The Bourne Identity“, wrote Time magazine’s Michael Demarest in April 1980, “is the most absorbing of Ludlum’s nine novels to date. His characters are complex and credible, his sleight of plot as cunning as any terrorist conspiracy. And his minutiae, from the rituals of Swiss banking to the workings of a damaged brain, are always absorbing. It is a Bourne from which no traveler returns unsatisfied.” The hardback was published in late March1980 by Robert Marek Publishers. In fact, the book had gained a spot on the national and Washington Post bestsellers lists even before it was officially published. The first edition had at least seven printings, reaching 300,000 through April 1980. In the U.S., the book became the second best-selling work of fiction for the year 1980 with sales of at least 325,000 copies. The Bourne Identity spent 95 weeks on the bestseller list. Bantam paperback - March 1987. The second Jason Bourne novel, The Bourne Supremacy, was first published in hardback by Random House in 1986. In this sequel to the first novel, Bourne by now knows that his real name is David Webb, and is settled and married in Maine working as a professor. However, he is still suffering flashbacks to his Jason Bourne persona, and is forced to undertake a final, possibly fatal mission to retrieve his kidnaped wife in Hong Kong. The book had a 650,000 first printing and a $150,000 advertising & promotion budget. There, an assassin has been busy posing as Jason Bourne, who the real Bourne must find and capture. In his quest to stop the imposter, he comes up against a plot that could plunge the entire Far East and then the world into war. According to a Publisher’s Weekly review, “Every chapter ends with a cliff-hanger; the story brims with assassination, torture, hand-to-hand combat, sudden surprise and intrigue within intrigue. It’s a sure-fire bestseller.” Indeed. At least one report said that Ludlum likely received a seven figure advance. The book had a 650,000 first printing and a $150,000 advertising and promotion budget on top of Ludlum’s brand name and the success of the first novel. It was also a Book-of-the-Month-Club selection. Like its predecessor, The Bourne Supremacy became a major hit, ranking as the 4th best-selling fiction book in U.S. for 1986. The hardback from Random House sold for $19.95. Conservatively figuring it sold its first printing, that’s a gross of about $13 million for sales of the hardback. DVD for 1988 TV miniseries. In 1988, The Bourne Identity TV miniseries was made as an adaptation of Ludlum’s first two Bourne novels. The two-part TV series starred Richard Chamberlain and Jaclyn Smith. It aired on ABC in early May 1988. 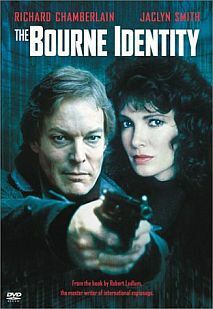 ABC developed The Bourne Identity for TV because Chamberlain was interested in playing the title role, according to Christy Welker in May 1988, then vice president for mini-series at ABC. “Richard has the ability to grab the audience’s attention and keep it,” she explained. “The more the audience gets to know Richard, the more they like him.” Susan Baerwald, vice president for mini-series at NBC agreed: “You have to like the people you invite into your living room,” she said, adding that Chamberlain’s acting range made him “a valuable property” who had received “a 50 share” for the 1980 TV broadcast of the Shogun miniseries. Chamberlain had risen to fame as TV’s Dr. Kildare of 1961-1966. Through the 1980s he began to play in TV movies and in 1983 became popular playing Father Ralph de Bricassart opposite Rachel Ward in TV miniseries The Thorn Birds (it earned a 59 percent share, second only to Roots at the time). Estimates for Chamberlain’s fee in the Bourne TV role were as much as $700,000.The Bourne Identity miniseries was a huge TV hit, not only in America and with advertisers, but throughout the world.Jaclyn Smith, cast opposite Chamberlain in the Bourne movie, rose to fame as one of TV’s Charlie’s Angels in 1976-1981. Smith, like Chamberlain, had done a number of TV movies, among them, an Emmy-nominated role for her Jacqueline Bouvier Kennedy (1981), and also Sydney Sheldon TV adaptations, Rage of Angels and Windmills of the Gods. Casting Smith and Chamberlain together in the two part, four-house Bourne miniseries — the “king and queen” of the TV movie circuit, as they were called — was a good bet for big viewing and eager sponsors. The Bourne Identity miniseries was a huge TV hit, not only in America and with advertisers, but throughout the world. In August 2002, the TV production was released on DVD by Warner Home Video. 3rd Bourne novel, paperback edition. The basic plot of the third Bourne novel by Robert Ludlum follows Bourne as he works to find his old enemy, Carlos the Jackal. As the Jackal enters old age, he decides that he must undertake one essential task before he dies: kill Jason Bourne. As a result, Webb must assume his Jason Bourne persona once again, a part of his life he thought was over, only now to protect his wife and children as well. In the search for the Jackal, Bourne and friends uncover a secret violent organization that dates back to the creation of Bourne, earlier days in Vietnam, and Bourne’s earlier rogue missions. Bourne becomes the lure for Carlos in a deadly trap by using himself as bait. The action moves from the U.S. to Montserrat to Paris, and then Moscow. However, Bourne and his allies barely escape the Jackal’s traps and fail in their repeated attempts to ambush him. Bourne finally tracks the Jackal down, and in a final confrontation, kills the Jackal and returns to his family. The book received mixed praise. Publisher’s Weekly criticized it for “formula writing that delivers even less than its meager promise.” Others called it “vintage Ludlum” and still others “stilted” and “repetitive.” In any case, it was another Bourne best-seller in 1990. The hardback edition was published by Random House on February 25, 1990. A Grafton version was published on March 8, 1990. Bantam released a mass market paperback on February 1, 1991. In March 2001, Robert Ludlum died of a heart attack at his home in Naples, Florida at the age of 73. Before he became a prolific novelist, Ludlum was an actor and theatrical producer. He turned to writing novels in middle-age, publishing more than 20 titles. His books were translated into 32 languages and sold in 40 countries. 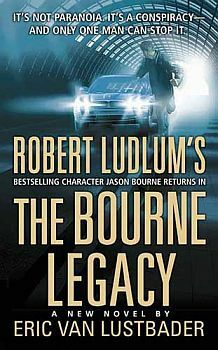 At the time of his death, Ludlum was awaiting the arrival of the first Hollywood film for The Bourne Identity starring Matt Damon, which Ludlum had a hand in both producing and adapting from his novel, working on those projects in the late 1990s. 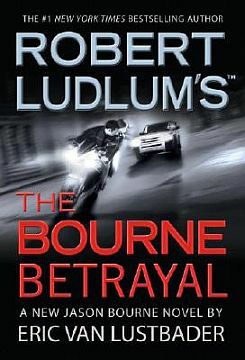 After the success of the first Bourne film in 2002 (see synopsis below), Ludlum’s estate saw an opportunity and asked another author, Eric Van Lustbader, to continue the series. The estate’s post-mortem publishing game plan is reminiscent of licensing and other deals for dead stars like Elvis Presley, Marilyn Monroe and Babe Ruth. . . Said Jeffrey Weiner, the executor of Mr. Ludlum’s estate in July 2007: “[I]f we can publish Ludlum books for the next 50 years and satisfy readers, we will.” According to New York Times reporter Richard Sandomir, “The estate’s post-mortem publishing game plan is reminiscent of licensing and other deals for dead stars like Elvis Presley, Marilyn Monroe and Babe Ruth and the film industry’s comfort with familiar franchises.” Lustbader agreed to help continue the Jason Bourne novels; he and Ludlum had shared the same literary agent and they admired each other’s work. Lustbader is a New York writer and author of numerous novels, including his own best-selling thrillers The Ninja and Black Heart. He would later author two more Bourne novels. And as Van Lustbader would later clarify on his website, there were no notes or partially completed manuscripts left to him by Ludlum. The Bourne novels he would write in 2004 and 2007 (see below) would be entirely his own creations, although using Ludlum’s Bourne character. Hollywood discovered Jason Bourne somewhat later than television — but not too late. 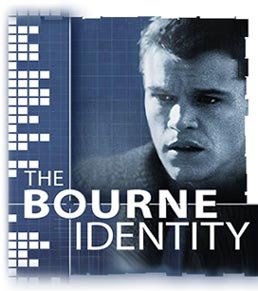 Universal Pictures produced the first feature film, The Bourne Identity, in June 2002. Matt Damon was cast as Jason Bourne, the amnesiac attempting to discover who he is. In his quest, he becomes involved with passerby Marie, played by German actress Franka Potente, who comes to assist Bourne in his journey. A wide range of actors were approached for the role of Bourne, including Russell Crowe and Sylvester Stallone. Damon was selected in part because he understood and appreciated that the film, in addition to being an action thriller, would also focus on character and plot. In the film, Damon performed many of his own stunts and underwent extensive training in stunt work, weapons training, and boxing for the film. With a production budget of $60 million, the film did quite well, grossing $121 million in the U.S. and $213 million worldwide, ranking 20th in the world for 2002. Universal's 2002 film, 'The Bourne Identity'. Of particular note was the film’s central car chase scene, which won formal recognition at the World Stunt Awards. The film also won an American Choreography Award for Outstanding Achievement in Fight Choreography. In January 2003 Universal released the first VHS version. 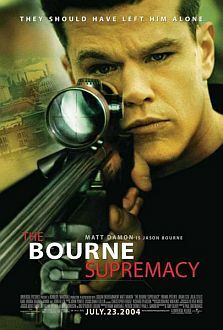 The DVD followed in July 2004 in advance of the film sequel, The Bourne Supremacy (see below). 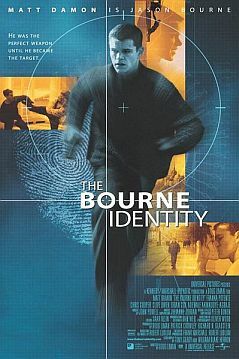 The Bourne Identity was also released on Universal Media Disc, an optical disc for use on Sony’s Play Station Portable. 1st Bourne novel by Van Lustbader. The Bourne Legacy is the first Bourne novel written by Eric Van Lustbader to continue the series. It was first published by St. Martin’s Press in June 2004. This novel finds Bourne in Washington D.C., working as a Georgetown University professor, now retired from his past and living a quiet life. An assassin’s attempt on him, and the murder of two of his closest associates prevail to resurrect his old persona, as Bourne realizes his legacy has followed him. Bourne is set up for the murders, and hunted by the CIA as a dangerous rogue agent. He has only one option to stay alive-and one last chance to stay one step ahead of an unseen assailant who is after Bourne for personal reasons. Pursued across the globe, Bourne’s on the run again, and on the edge of discovering the truth – that he’s become the expendable pawn in an international terrorist plot: a Hungarian terrorist and Chechen rebels are plotting a surprise for world leaders meeting in Iceland. Reviewers generally welcomed the new Van Lustbader novel. “Overall, fans of the Bourne series books will find in author Eric Van Lustbader a very worthy and more than capable writer to continue this splendid saga. . .” wrote one on-line reviewer .” Lustbader’s Bourne is just as haunted as Ludlum’s,”added Edward Nawotka of USA Today’…..”Lustbader is able to create an ingenious link to the previous books by filling in heretofore unknown details from Bourne’s long, tangled history in Vietnam and Cambodia. . .” Nawotka had generally high praise for the new Bourne author: “Lustbader remains a fine choice to fill Ludlum’s large shoes, and he has delivered a work worthy of the Bourne legacy.” By August 2007, The Bourne Legacy had sold 272,000 hardback and paperback copies. 2nd Hollywood film, July 2004. The Bourne Supremacy, the second Hollywood film with Matt Damon as Bourne, was released by Universal Pictures in late July 2004. It continues the story of Bourne’s amnesia, as the former CIA assassin seeks to learn more about his past and is once again hunted by the CIA. Although this film departs from Ludlum’s Supremacy novel in its plot, and also borrows from the later novel, The Bourne Legacy written by Eric Van Lustbader, it continues the general thread of the first film; a spy thriller taking viewers on a trail of chase-and-intrigue through Asia, Europe and Russia. This film, like the first, was generally well received by critics and moviegoers. It also did quite well, topping box office receipts at its July 2004 release, grossing more than $176 million in the U.S. that year. . The Bourne Supremacy’s worldwide gross exceeded $288 million. The fifth Bourne novel in the overall series, and Eric Van Lustbader’s second contribution, The Bourne Betrayal, was released in hardback by Warner Books/Orion Press in June 2007. It was released several weeks in advance of the third Hollywood film, though unrelated to that film (see below). Other editions of this book used cover imagery suggestive of an earlier Bourne movie scene. In any case, by mid-July 2007 this book had sold 86,000 copies and was #9 on the fiction best seller list. In Betrayal, Jason Bourne takes a mission to rescue his only friend in the CIA who has disappeared in Africa while tracking shipments of yellowcake uranium. Once safely back in America with his friend, Bourne is persuaded to help track the money trail of terrorists in Odessa who are buying the nuclear material. But during the hunt, Bourne is hampered by flashbacks of unfamiliar places and events and he wonders if someone is brainwashing him to throw him off the trail. He also has doubts about his rescued friend’s real identity. Still, Bourne continues gathering evidence while trying to stay one step ahead of the terrorists hellbent on destroying the U.S.
3rd film – ‘The Bourne Ultimatum’ – August 2007. New paperback edition of older novel touting 2007 film & its imagery. The third film in the Jason Bourne saga, The Bourne Ultimatum, picks up after the harrowing car chase in Moscow from film #2, The Bourne Supremacy. It follows Bourne as he travels to Paris, London, Madrid, Tangier, and New York City to uncover his real identity, while the CIA continues to send assassins to take him out. As The Bourne Ultimatum began hitting theaters in early August 2007, Universal Pictures released a three-disc DVD set entitled The Bourne Files that collectively packaged the first two films – The Bourne Identity (2002) and The Bourne Supremacy (2004) – along with a third disc of extras. Random House/Bantam also issued a new paperback version of Ludlum’s earlier book, The Bourne Ultimatum, with a cover image suggesting a film scene, along with “now a major motion picture” also on the front cover. Film reviewers were generally positive on The Bourne Ultimatum. “A thoughtful, superior action movie”, wrote Mick LaSalle of the San Francisco Chronicle. In the hype for the film, actor Matt Damon had made the publicity rounds and appeared on TV talk shows such as David Letterman and the Tonight Show with Jay Leno. There was also some media and web hype offering a James Bond/Jason Bourne “who’s-the-greatest-spy”comparison. Universal Pictures also launched an online game, teaming up with Google for the promotion, which used the title The Ultimate Search for Bourne with Google. In the game, players try to hunt down the elusive rogue agent, and at the same time are taken on a tour of Google tools — YouTube, Google Maps, and web searches. Participants must answer trivia and find random clues buried on the net to compete for the grand prize — a 2008 Volkswagen Touareg 2, the car model used in the film. The Bourne Ultimatum movie, meanwhile, had a good opening weekend box office in August 2007 at $69.3 million, a record for a single opening in that month. By the end of its fourth week, August 27th, the film’s domestic box office gross was $185.1 million, with more active weeks ahead. Cover illustration for "The Bourne Conspiracy" video game. Not to be left out the Bourne entertainment juggernaut, the video game industry jumped into the fray with a new game for use on the PlayStation 3 and Xbox 360 consoles. That game, called The Bourne Conspiracy, was released in the summer of 2008. Developed by High Moon Studios, The Bourne Conspiracy was designed to expand upon Ludlum’s Bourne character, immersing the player in an espionage action adventure. The player assumes the role of amnesiac Bourne in the game and must rid his life of all those hunting him, whether U.S. agents or foreign terrorists. In the game, the Bourne character has a full arsenal of weapons and survival know-how — sufficient “to engage and eliminate small armies.” The video game also features famous moments from the best-selling novels and the film The Bourne Identity, as well as expected new plot segments as the game series develops in the future. In 2012, Jeremy Renner played another agent, Aaron Cross, in the 4th Bourne film, “The Bourne Legacy”. After Matt Damon had stated in 2007 that he would not appear in further Jason Bourne films, actor Jeremy Renner took on the lead role of another black ops agent named Aaron Cross in the fourth film of the Bourne series, The Bourne Legacy. Cross is a member of CIA-run Operation Outcome whose subjects are genetically enhanced. And since Jason Bourne in previous films has already publicly exposed the CIA’s handiwork in earlier and ongoing programs, Cross is now on the run for his life as well. In the film, however, various clips of Damon as Bourne are shown, and his name is mentioned several times, keeping Bourne and Damon in the mix. This film seeks to continue the story line of the film series without changing key events. Parts of this film, for example, take place at the same time frame as the previous film, The Bourne Ultimatum. Although this film has the same title as the Eric Van Lustbader-written Bourne novel, The Bourne Legacy’s actual screenplay bears little resemblance to that novel. The reviews of the film were mixed, with some on the positive side saying that Renner played a good role and the story offered some proof there was a good pot of material for continuing the Bourne series into the future. Other reviewers, however, were less complimentary, saying the Bourne tank was running near empty, or as Michael Atkinson of The Village Voice put it: “The Bourne films have more than just overstayed their welcome and outlasted the Ludlum books—they’ve been Van Halenized, with an abrupt change of frontman and a resulting dip in personality.” In any case, The Bourne Legacy did o.k. at the box office, pulling in more than $275 million worldwide. Poster for 2016's “Jason Bourne” film with Matt Damon. After a nine-year absence of not appearing as the Jason Bourne character in the Bourne film series, Matt Damon returned to his well-known role in the fifth and latest film in the series, titled Jason Bourne. Apparently, there was some on-again-off-again moments in Hollywood in getting this film on track, but by the Fall of 2014 commitment on the film had been reached after Damon and director Paul Greengrass re-united for the project. Jason Bourne is meant to be a direct sequel to The Bourne Ultimatum of 2007. Bourne, the former CIA assassin – and “million-dollar killing machine” as he is sometimes described – is still unearthing bits and pieces of who he truly is, having suffered an earlier near-death experience in which he lost his memory. Now Bourne has a better understanding of himself and what has happened in his past. Still, in this film, he is on a mission to set things right after a WikiLeaks-like revelation and resulting complications set him on a task to even the score, just as higher ups — discovering that he is still alive and walking around – want him taken out for what he knows and could publicly reveal. This time, part of Bourne’s self-designed mission takes him right to the top – pursuing bad guy CIA director, played by Tommy Lee Jones. Along the way there are the usual but always enthralling fight scenes and car chases – which some reviewers, this time, found overdone. In fact, there are some very good and interesting threads offered in the film – especially those built around social media, government internet mining, and domestic surveillance. Yet the breathless, non-stop action, as some reviewers see it, does not allow for a more thoughtful treatment of story line elements. Still, for the testosterone-peaking target audience and die-hard Jason Bourne fans, the mayhem and Bourne’s super-human physical talents – whether bare-knuckle knock-outs à la extreme fighting style, or laying waste to gangs of would-be hit men – are just what they expect to see, and are no doubt happy to pay the price of admission. Jason Bourne premiered in London on July 11, 2016, and was released in the U.S. by Universal Pictures on July 29, 2016. And despite some less-than-enthusiastic initial reviews, the film was expected to break initial weekend box office records and reap hundreds of millions worldwide. The Jason Bourne franchise appears to be alive and well, now into its fourth decade as a thriving enterprise. Its net global worth as of 2016 — when all the related merchandising, books, film rentals, and DVD sales are tabulated — is now well over $1 billion. And it appears there will be more Bourne ahead. Yet, as one Hollywood producer recently put it, “at some point, Bourne will have to discover his identity.” And as of this last film in 2016, he appears to have reached that point. Still, given the material being generated by Bourne author Eric Van Lustbader (see table at left for list of his recent novels), and the fertile imaginations of Hollywood scriptwriters, there will likely be no shortage of newly fascinating Bourne twists and black ops scenarios that will lead to continued best sellers, more movies, and more video games. Stay tuned; Jason Bourne has not left the building. Publisher’s Weekly, editions of March 7, 1980, March 28, 1980 and April 11, 1980. Michael Demarest, “Terrorists Take Over The Thrillers,” Time, Monday, April 14, 1980. Aljean Harmetz, “Richard Chamberlain’s Mini-Series Mastery,” New York Times, May 1, 1988. “Thriller Writer Ludlum Dies,” BBC News, Tuesday, 13 March, 2001. 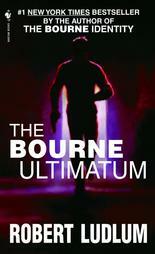 Edward Nawotka ” ‘Bourne’ Chases Ludlum’s Legacy,”USA Today, July 14, 2004. Paul Davidson, “The Bourne Ultimatum: Why Stop There? – Spy Series Could Span Five Movies,” IGN.com, February 16, 2006. Richard Sandomir, “The Ludlum Conundrum: A Dead Novelist Provides New Thrills,” New York Times, July 30, 2007. “20th-Century American Bestsellers,” Graduate School of Library and Information Science, University of Illinois, Urbana-Champaign, Illinois, 2006.